RME’s Fireface UCX is an incredibly well integrated pro audio interface in a super-condensed footprint for studio and live recordings. 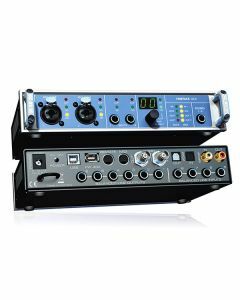 It renews RME's rich heritage of engineering small-sized premium interfaces, squeezing into a half-rack size unit what would typically be spread out over two or three 19 inch panels by other manufacturers. The end product is an awe-inspiring mixture of RME's most celebrated products: Fireface UFX, Firefaces UC/400 and Babyface. The Fireface UCX isn’t simply a reduced version of the smash hit UFX, with the HFX-core, the preamps and the complete effects engine, the UCX furthers the lineage of RME's immensely successful compact interfaces, and pairs it with the intuitive versatility of the Babyface through the optional RME remote.